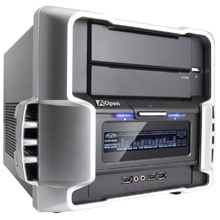 AOpen G326HT is for microATX form factor HTPC system. It has great expend ability and support multimedia entertainment. G326HT also provides useful information such as Headline News and E-mail Check; and its scheduled power on/off will be very handy in your life. Supports 12cm fan ATX power supply for good system thermal & low noise. Special thermal design with vents on both sides of case can improve cooling. Firm and solid structure, roll column design with bend-in edges.